One of the biggest “improvements” that Mozilla claims is the Firefox memory usage, in particular, the vanquishing of memory leaks. Although Firefox memory usage improved a little over the last few years, it still uses a lot of memory; a little more than I feel comfortable with. And for this reason we created Firemin. We like keeping our apps running for a few days (that’s just the way I roll) and because of this Firefox was using over 2000MB of memory after about 3 days. It’s quite normal for Firefox to be sucking up over 250MB of memory right off the bat. In a memory leak you’ll see the memory usage keep increasing the longer the program is open/in-use and this is exactly what happens with Firefox. Rather than complain about it, we decided to fix it. Enter Firemin; simply put, Firemin will attempt to eliminate Firefox memory leaks and decrease the amount of memory Firefox uses. All I did was tweak our Memory Booster a little and applied it to Firefox and this solved the memory leak issues. The method Firemin uses to decrease Firefox memory usage is not proven and the debate over if it works or not will go on until the end of time, but the logic remains; if it works for you, use it and if it does not, don’t use it. It is really that simple. Firemin comes in two flavors. A setup utility for installing Firemin to your computer and a portable version for running it straight from a memory stick or portable hard drive. The portable version will not write any settings to the registry or leave any traces on your computer. Just download which ever version you prefer. Firemin uses the exceptional Firefox 2005 icons by Jairo Boudewyn (weboso). Download the Firemin source code from the GitHub Repository. To compile (build) the sources, you will need to download and install AutoIt Beta version 3.3.15.0 or later. Download the AutoIt Script Editor (Scite) here to edit the source code. Does constant mmory management cause hardware issues? A good idea in principle but in practice it only eats my processor which goes up to 50%. hi bro, when will we have the linux version? Firemin set to Reduce FF memory usage to below 900 MB, Reduced every second. Firemin says “Process Usage is 732 MB, but Windows Task Manger says 2638 MB is being used. Given CPU temp. and fan operating speed and frequency, Windows Task Manager is obviously correct. WTF isn’t Firemin working as it should? My Avg detected Filerep Malware and blocked the instalation. Firemin is amazing, and I recommend it regularly to people who, like me, use older hardware (Thinkpads). Is there a 64-bit version of the latest update? The 64-bit version is build into the installation file. It will automatically install it when a 64-bit Windows is detected. Or alternatively, the 64-bit version can be found in the portable package. Thank you for recommending Firemin, the support is appreciated. I’m in a loop, I click to download, go to Downloads page, click Firemin it brings me back to this page etc. Maybe the hotlink protection who doesn’t work proprely. Your description of Firemin is way too modest. Especially on Chrome (Windows 7), it stops the slow growing memory bloat in its tracks. Instead of seeing 200MB or more for several processes I see 20MB or 30MB. It hits 150MB when e.g., streaming a movie but as soon as the movie stops, it’s back down to 20/30 MB. I have had no problems with stability or interference with addons (using it a year or so) and it should be much more widely promoted for both Firefox and Chrome. If you made a version of Firefox using the Mozilla base, and a version of Chrome using the Chromium base, incorporated Firemin into both, and got them included in some of those “browser efficiency” comparisons you’d very quickly have the most downloaded and installed browsers. I cannot donate much but will tell friends about Rizonesoft’s greatness. If it works for you, given the magnitude of the issue it’ll have resolved, it’s worth at least $50. If so, make some sacrifices and give the guy $50. Don’t be a low-life stingy tight-arse piece of filth like 95% of humans. hi. it’s CPU high used with Firefox Quantum 62. need update. Hello good sir, this is a beautiful piece of software thank you, it is working just fine. I tried with Firefox Quantum latest release, but it freezes some websites. And till yet I couldn’t reach you! Will this work for pale moon? I have troubles with Firemin and Firefox Quantum latest release. There are some Cloud-Websites hanging. Have any chance of a Linux version of Firemin or Firemin exist only because Windows it’s a wrecked system pasted with junk scripts? Every time you have an update and I attempt to install it, get a message “ShellEx Failedcode 8235 A referral was returned from the server.” Same message, no matter what computer I attemtp to install it on. Have complained in past. No response from you. Sad. I find Firemin 6.1.0.5030 Chinese traditional language file has some untranslated strings, so I retranslate it. The link for the portable version is broken. We arrive on the download page but .zip don’t download. Link for the .exe run well. Hello, and verified that Firemin also works with games. How much RAM is advisable to reduce? Is the normal download working? That is the download. From what website are you downloading? I get warning from windows defender so I skip this. I know it might still be ok but I dont want to take any chances. Seemed like a great solution to a problem that just shouldnt even exist in the first place. Is there browsers that handles memory better than firsfox ?? I am getting tired of firefox with ALL the problems it comes with, like the plugin container in the past…maybe it is still part of the problem. Firefox devs seems to be morons. Windows Defender warns you of Microsoft spying you while you use Windows? Certainly Firefox have it’s faults but I prefer a company that respect my privacy that another that spy me in every way it’s possible. And for what I have learned with experience, in fact the problem of leakage occurs in WMM (Windows Memory Management). Firefox don’t have this faults on Linux or MacOS. It seems to work awesome for Firefox, thank you! Quick question: does the MemBoost work the same way but for all apps? So do I need to run them both or MemBoost will work for everything including Firefox? You do not need to run them both, but I have found that running Firemin with Memory Booster yield better results. Thank you, Derick, will try two apps at the same time =) With Memory Booster Chrome is also not consuming too much memory now. My ultrabook finally works as it should. You are just awesome, thank you! Hope you’ve got my donation already =) Thanks again, you are awesome! Than you for your support. Although just using Firemin is enough support, a donation goes a long way. Thank you for that. 🙂 Please let me know if there is anything else I could help you with. If you find a bug or something is not working as expected, do not hesitate to let me know. Realy nice progam. Reduced Firefox from about 1,5Gb to 50 Mb of memory usage. It worked on Chrome too. Is it possible to run two Firemin at the same time on for Firefox and one for Chrome? or the possiblility to monito two browsers at the same time? Although Firemin is not able to monitor both browsers, you can select your main browser and then enter the other one’s process into Extended Processes. For example; select Firefox.exe as the main browser and then enter Chrome.exe in Extended Processes. Agradezco esta utilidad, Firemin, porque muchos de los procesos que se ejecutan en memoria pueden ser reducidos con este sencillo programa. I too have the same issue as anonymous, when Windows 7 Home SP1 gets to the desktop the Firemin settings screen is launched automatically. I have several computers and I have halted installation for this. It does not affect my Windows 10 machines, they are fine. Windows 8.1 I have not tried. My Windows 7 machines I only installed on one when I noticed the issue and halted till I can find out why this is happening on 4935, Reverting back for now. Assume I use 32bit Firefox on 64bit Win7: Do I have to install 32bit or 64bit Firemin? Does Firemin work for ALL Firefox versions (even for older v52. * Firefox ESR) ? Firemin 64bit works with Firefox 32bit and all older versions. I have noted in he current build that when I start my PC Firemin starts up with a statup screen instead of just being minimized in the Taskbar. If I click on the Firemin application page it then minimizes to the tray advising via a popup message that it is minimised but still working. Is there anyway to get the app to start with windows but not show the main screen on startup and just self minimize to the tray. Do you have certification from Mozilla? Not sure what you mean by a certificate. Firemin was not created with Mozilla and or endorsed by them. Access denied when trying to download the latest version. Why do you have to zip the installer, why can’t you just offer the executable for download like others do..?! No the link is not fixed. I tried it today, March 7th, 2018 and it is not working. After clicking on the 3 different links about 6 times, it finally worked. I could not reproduce the error. Could you please give me more information: OS? 32 or 64-bit? As much information as you can. The error occurs on menu creation, but after testing it on a Windows 7 and XP installation, I recieved no errors. After I received the error, I reinstalled 4890 overtop again, and received the same error, however, firemin WAS updated to latest version. I tried again just now to reinstall overtop, and did NOT get an error. I suspect it was because I rebooted after the first two attempts, so this third attempt had no error message. I think rebooting solved the issue. I glad your issue was resolved. Please let me know if you experience any other issues I can help with. Went to upgrade to latest version 4890 of Firemin today and while installing, Avast Anti-Virus flagged it and would not allow me to proceed. Also, why is the file labeled “unknown publisher” after I downloaded it went to install. I still have the prior version operational, but this latest version will not install until it is analyzed and passes muster with Avast labs. All Rizonesoft will show “Unknown Publisher” until we get our hands on another Software Signing Certificate. We are working on it and if all goes according to plan will acquire one at the end of February. Furthermore, please read “Is Rizonesoft Software Safe?” for more about false-positives and a possible solution. Here is the VirusTotal scan: https://www.virustotal.com/#/file/dcaa9cf56fd02a358a08006bac91fa9c6d8ba6feb08e6630edc70093ba175dcb/detection As you can see the detection is a false positive. Add an exclusion for Firemin in Avast. Use this contact form to submit the file: http://www.avast.com/contact-form.php. Make sure you’ve noted that it is “False Positive” or send the file to virus@avast.com. Pack the file into ZIP archive and lock it with password “virus” (without quotes) and attach it to the e-mail. Write the same password inside mail body, so the Avast analysts will know the password right away without guessing. You can also add web address to that file (or webpage of the file/program) if it’s on the internet. Add your own note on why do you think that it’s a false positive. If it was really a false positive, you will get a reply mail after some time. In conclusion, thank you for your support! Same problem here, Panda Free Antivirus (Panda Security 2017) v 18.0.00, on w7 ult x64. Hi I tried downloading the latest version of firemin (setup and portable) but apparently your URL links for the latest versions don’t have enough parameters submitted in them (but the previous versions have their own parameters – only the latest versions are problematic). I had to copy the previous firemin version URLs and amended the missing parameters to fit the updated version in order to begin downloading. Other than that, thank you for your continued development. On Windows 10, the Windows Defender found the Firemin_X64.exe is Trojan:Win32/Azden.A!cl in Firemin_4856.zip. Whats the point of using Firemin if Memory Booster does the same and covers all the processes? Or am I loosing something? Firefox has it’s own issues that can only be addressed with software such as Firemin and the latest version (6.0.1.4856) improves memory usage measurably, that is quite noticeably, at least it does for me. since firemin build 48xx – if you click on the icon on the task tray, the Extended Processes button does nothing, neither on win 7 or win 8.1, yet if right click the tray icon it does display the extended process panel. Also under Win8.1 x64 , Firemin does not auto start with windows. Win8.1 x64, i3 cpu , AVG antivirus. … or are you supposed to assume the [X] button is to close the settings panel? I see there is a new firemin update to build 4839 today, have not yet tried that out. … which reminds me – often if the update notify panel has been ignored for a while, and/or the settings panel left in the background, you cannot close either panel without using right click on the tray icon to actually Close firemin – or sometimes need to forcibly close firemin with task manager… then have need to re-start firemin, even on Win7. sorry for my comments turning into a novella . [ ] notify me via email, only on reply to my comments post. “4837 : 64-bit” and prompts me to download the update again. Any ideas? I’m using Windows 7 Enterprise SP1 x64. Thank you. 6.0.0.4838 is only 32-Bit! 64 bit has not been updated, is still version 6.0.0.4837! It would be nice if Firemin displayed “Reduce Firefox memory” in the taskbar instead of displaying “Firemin_Xxx.exe”. While Firemin 4825 is running on Windows 7 Pro(64bit), the Esc key will not work. I had been beating my head on the wall. I use Firefox – often with lots of Tabs. Memory use creeps up and Up and UP. 200 — 400 heck, I hit nearly 1 GB and this is running on an old XP with 2 GB. And I discovered this. Found this and IT WORKS Very Well. And I am running the latest Firefox and it still LEAKS. 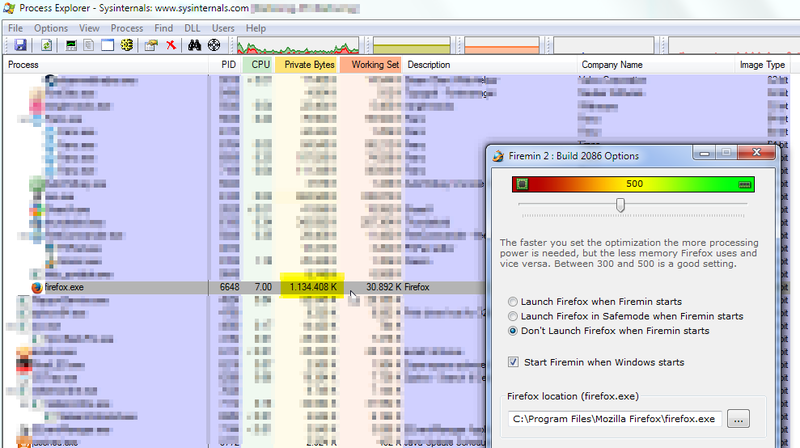 Now with 11 Tabs open and Tunderbird as well (another leaker), Firefox shows 70 MB in Task Manager. Absolutely CRAZY! My memory has gone from 2GB to under 100MB. Brilliant!! I know it’s a big ask but I would like to see the CPU usage come down. Apart from that a big THANK YOU! Well who guess , firefox written C++ language , that memory leaks will appear. firemin very good app, it works superb and it is FREE, EVEN BETTER I SAY! Another request / suggestion — one which might be another way to customize the frequency with which Firemin does its thing, as many have requested: add a ENABLE/DISABLE selection toggle to the systray icon context menu. That way one could leave Firemin running all the time and “manually” invoke it periodically when desired. I realize this means coding the functionality into the program and I don’t know if that is easy or not, but in case it is, it would be great. Thanks. Will have a solution ready in the next release. hi! I just downloaded Firemin. However, when I restarted PC, the warning(?) window popped up. I uninstalled, downloaded and installed it again. But this window popped up. How can I fix it? Did I do something wrong? I managed the problem. thanks! Nice app but did a way exist to clear the ram only every 15 or 60 minutest? the Problem is that i play minecraft and every minute the firefox comes in foreground when i use firemin. That isa brilliant idea. I will mostdefiinately add it to future releases. Firefox ESR 52.2.0 (32 bit). The memory consumption is low from 500MB to 50Mb … having 3 open firefox mozilla tabs. A single Mozilla Firefox window consumes me 15 MB of memory. Firefox ESR 52.2.0 (32 bits). El consumo de memoria bajo de 500MB a 50Mb..teniendo 3 pestañas de mozilla firefox abiertas. Una sola ventana de Mozilla Firefox me consume de memoria 15 MB. Wow!!!! With this app installed and working, the amount of memory that Firefox is using is unbelievably low. Glad I found this app and it will be on my computer from here on out. Before installing this app, I had times when Firefox would not respond and I had to restart it. Memory usage is changeing quite a bit, but it is still probably less than 250 meg while previously I had times when it got to 1.5 Gig and that is where it loses control and nothing further can be done to it except restart it. GREAT!!! 😀 Memory optimizing – from 800mb to max 250mb and work it. Well it works, but for some reason the hard disk usage sky rockets to 100% and it remains that way when firemin is running. So you get rid of one problem and get a new one, not much of a fix. That happened to me too. I had to uninstall. Please update it, it makes Firefox slower sometimes. When using Firemin Mozilla it slows down too much and if I use it for a while causes a memory failure and a blue screen. I use Windows 7 with 4 GB of ram. Just open Firemin window then Browse or got to folder and select firefox file “C:\Program Files\Mozilla Firefox\firefox.exe”, and don’t forget to Save your settings. Add Firefox.exe to Extended Processes. I still wanted to write a tutorial for the new Firemin. I’m just not getting around to it. To get Firemin working for Palemoon, all you need to do is select the Palemoon exe on the main screen. I used this for a little while until I found a solution, then didn’t need it. No, don’t be sorry. It is good you found a solution. 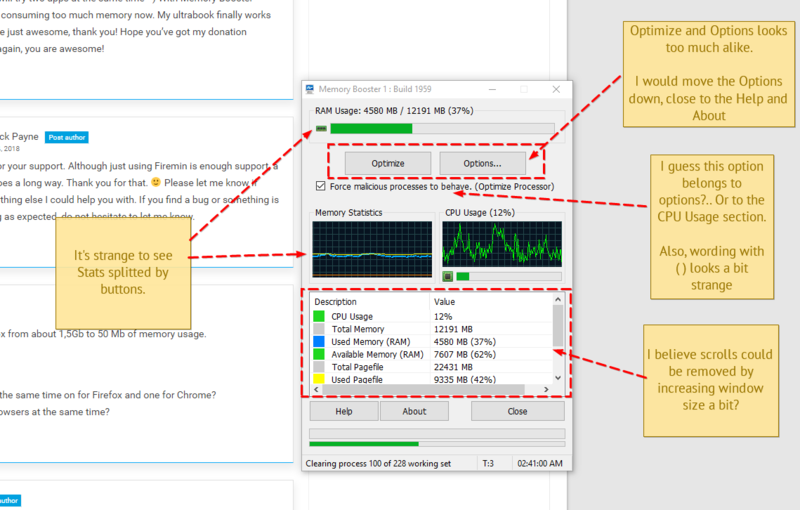 I have used the software and from the Windows Task Manager, if I observe a decrease in RAM usage, but third party applications like hackerprocess I see the typical value of using Firefox RAM for daily use, (400-500 MB ). That sweats, because this difference. I love Firemin. Using it for more than a year now. Lately, Firefox gives a “Warning: Unresponsive script” prompt that says “A script on this page may be busy, or it may have stopped responding. You can stop the script now, or you can continue to see if the script will complete.” Only option for me is to restart the machine. Windows 7, 64-bit, 8GB RAM. Please try to look into this issue if it needs addressing. It’s well worth the donation I made. Keep developing new stuff. Sound clipping issue still persists in YT and Twitch. I installed the .exe version of *4615 on an Asus K54C laptop running Windows 7 64 with 4 Gigs of RAM today after making a system restore point. Firemin is working fine so far. Firefox memory usage has dropped from about 1 to 1.6 Gigs to about 20 Megs or less. Youtube audio seems fine as I haven’t noticed any popping yet with the default settings. All pages are loading much faster. By default Firemin is set to work with Thunderbird and when I open it with Firemin running, the mail loads instantly for me. Windows memory management has never worked on this laptop, right anyway. Firemin does work. The difference is like night and day. It also places an icon in the system tray where if you run into problems, you can exit easily. Good job and thank you. Could you please give me the exact error you see when executing the Firemin executable. I am getting a false positive on build 4615 with Zemana Antilogger. Not sure which other programs think it’s a virus. Finally a solution that works! Firemin works like a charm! I mean, I have been fighting with enormous memory consumption by Firefox for years and with no real effect! Until now – I found your little tool and it makes such a huge difference! It reduces memory consumption instantly, I can clearly feel this effect on my system (Windows 7 Pro, 64-bit). Thank you very much developers!!! Rizone, sent an email already regarding this issue but wanted to place it on the board as well. In summary there does seem to be an issue regarding audio when using firemin. When streaming media the audio is crackling/popping. I’ve used multiple mozilla browsers, safe modes, extension/add-on troubleshooting, cache clearing, but to no avail. I’d like to suggest providing a more dynamic range of boost intervals and memory reduction limits considering the users able to allocate more memory to it. Allowing a less frequent API call and allowing more memory to the browser would help in eliminating the sound problems. Not sure if this is a bug within the gecko engine, plugin-container, or maybe flash itself, but as the recent comment states, when firemin is closed the audio is flawless across any moz based browser. Thanks again. Hope this helps and look forward to any progress. Mozilla is great, but this tool makes it 100 times better. You are ,ale a plan update notifcation / system auto-update in app? Hola, tiene un problema firemin. El problema consiste en que al momento de ver un video de youtube la voz de los videos se entre corta! Use muchos meses firemin pero actualmente tiene esa falla ya lo comprobé 3 veces haciendo uso normal de Firefox Mozilla sin firemin funciona perfecto Podrian arreglar porque antes funcionaba perfecto!!!!! Please type your comments in English. So, you having issues with watching YouTupe Videos while using Firemin. The voice sound is being cut off. Without Firemin it works perfectly. I will look into this for you and have a solution soon. I have the same problem. The sound is clipping on YT. No optimize databases features option anymore? It created Mozbase Optimizer for that. Will update Mozbase soon. Any plans on making a native x64 version of this app, yes I know x32 runs in x64. Good idea. Will take a look at releasing a x64 version with the next release. The new build is amazing with the new extended processes! The plugin-container.exe has been the biggest headache with it’s insane memory usage. I have installed scripts to limit flash, etc.. but this destroys any script I have used in the past! Well worth a donation and hope others follow along and do the same! 5 out of 55 does not a virus make. Anyway, will start reporting this false positive to the respective anti-virus companies. Hello again, I tried to make waterfox to firefox, copy all files and rename waterfox and it works fine. Waterfox needs up to 3GB and now about 4MB. I can´t believe! Is it possible to use Firemin with waterfox, and when, how? I tried to change the ini file, but Ithe the programm itselfe changes it back. Private Bytes refer to the amount of memory that the process executable has asked for – not necessarily the amount it is actually using. They are “private” because they (usually) exclude memory-mapped files (i.e. shared DLLs). But – here’s the catch – they don’t necessarily exclude memory allocated by those files. There is no way to tell whether a change in private bytes was due to the executable itself, or due to a linked library. Private bytes are also not exclusively physical memory; they can be paged to disk or in the standby page list (i.e. no longer in use, but not paged yet either). Working Set refers to the total physical memory (RAM) used by the process. However, unlike private bytes, this also includes memory-mapped files and various other resources, so it’s an even less accurate measurement than the private bytes. This is the same value that gets reported in Task Manager’s “Mem Usage” and has been the source of endless amounts of confusion in recent years. Memory in the Working Set is “physical” in the sense that it can be addressed without a page fault; however, the standby page list is also still physically in memory but not reported in the Working Set, and this is why you might see the “Mem Usage” suddenly drop when you minimize an application. When trying to launch firefox, it always uses “C:\program files (x86)\…” even though I set a different location. When trying to optimize, it hangs at “initializing”, probably as it doesn’t find Firefox’ profile directory (which I have moved out of the %appdata% folder). Will have this fixed in the next release. Can it be used in win 10? is FireMin still working as intended with the latest versions of FF ? I need to edit it for palemoon but once edited it wont save… any ideas? @Dan Walker: Make sure that Firemin is not in memory before you edit the files. Use Windows Task Manager (ctl-shift-esc) to verify that Firemin is not running. J’ai installé la version buid 2086 puis ensuite la version beta 3997 ? J”ai maintenant 2 icônes dans la barre des taches ? Comment désinstaller la première version ? Excellent, the reduction in memory usage is simply amazing! Being a heavy Firefox user, your tool is a blessing for me. Thanks!!! I went from 600K-800K to less than 10K. Any chance you have something like this for Google Chrome? @Aaron – The Great Suspender maybe an option…? is there any full installer ? the setup file in zip file won’t open ! It opens, it just goes to your system tray. Click the up arrow by your clock to find it. You will see the firemin icon that you can right click and configure. Desculpe, em vez de baixar o Firemin esta baixando o Complete Internet Repair, porfavor poderia arrumar o link. why when i try to download firemin do i get pixrepair ?